Peter and Anthea Hoffmann have their own patch of paradise in their Mclaren Vale property of about 20 acres of vines some old buildings which are now the homestead, cellar door and their Current Shed Restaurant. See the wineries map for their location – remember to click on Hoffmann’s on the left hand side of the Google Maps page to open the correct location pointer. 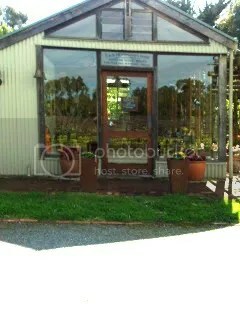 Also, check out their web site at www.hoffmannswine.com.au. The cellar door is the last winery on Ingoldby Road and is quite idealic – vineyards, gardens, vine covered courtyard and restaurant. The Hoffmann’s have had the property since 1978 and their hard work over many years has produced wonderful surroundings with good selection of grapes – Chardonnay, Sauvignon Blanc, Semillon, Merlot, Shiraz and Cabernet Sauvignon. There is an old world charm at the cellar door as there is a number of old collectible type farming type implements, plus the rear window shows an unusual trellising of a grape vine. 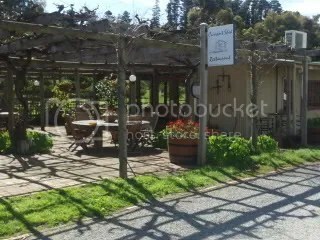 The cellar door also sells some chutneys and sauces made at the Current Shed. This wine is 70% Sauvignon Blanc, 20% Chardonnay and 10% Semillon. This in an unashamedly drink now, drink cold, wine. There is a persistent and pleasant Nashi Pear character on the nose and this comes through on the palate. A small proportion of this wine was fermented in new french oak. The amount of oak treatment is just right – any more and it would have been reminiscent of the “drinking oak with your Chardonnay” days from the 80’s. The wine shows stone fruit on the nose and in the mouth with a nutty lingering complexity. There is no creamy characters that I was expecting so I assume that malolactic acid fermentation did not occur, or only minimally, in the wine. This is definitely a food wine and I would try it with home made Pea and Ham soup. I do not normally like straight Merlot wines – but was this a surprise! The wine has the usual soft tannins but the oak treatment is complimentary to the soft tannins. The secret to this seems to be the use of old american oak. There is plenty of blackberry and dark cherries on the nose with spice on the palate with a mocha finish. This wine is made from grapes from the estate vineyard of the famous Reynell clone and is partially fermented in french oak. It has all the typical cabernet characters. The wine I tasted was opened just prior to pouring and so was not representative of the true wine. The wine had a closed nose and was thin in the mouth. Some characters of blackberry and chocolate were present. I tasted this wine a number of months ago and was impressed enough to buy it. The Australian blend of Shiraz and Cabernet so popular in the 70’s and 80’s but went out of favour when the trend was for varietal wines. This was a pitty as the blend seemed to work well – the ripeness of the shiraz complimented the lack of a mid pallate of the cabernet (the “donut” character). It is good to see some examples of the blend finding it’s way back into production. The wine is 70% Shiraz and 30% Cabernet and the base wines were the same as the varietal wines above. The wine shows rich ripe fruit and silky tannins combined with the black fruits of blackberry and blackcurrents. A classy wine that I just had to bring home with me. Sitting here writing this I am thinking of Individual Beef Wellingtons with using Wychwood Meat rump steak, Maggie Beer Pate and local button mushrooms wraped in pastry, creamy mashed potato, green beans and some broccoli from my vegi garden. My mouth is watering just thinking about the combination. 1 bottle of each wine (6 in total) for $A95, a saving of 27% from the single bottle price. 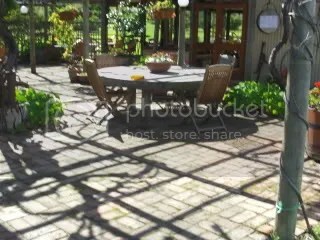 This entry was posted in Mclaren Vale, wine and tagged cellar door, Mclaren Vale, Shiraz, wine. Bookmark the permalink. Is Hoffmann’s the maker of the 1980 Browlow Medal (commemorative) Port ? I am not sure about the Port. The Hoffmann’s have sold their winery so I cannot ask them.